MIAMI – Born at sea. That’s what doctors wrote on the birth certificate of little Haiden Morgan. His parents from Utah and were vacationing aboard a cruise ship when he unexpectedly made his debut. Emily Morgan was due in December and got clearance from her doctor to take a 7-day cruise to the Caribbean at the end of September. Two days into her family getaway, she began having contractions. Hours later, her baby boy was born, 15 weeks early and 14 hours away from the nearest hospital. Chase and Emily Morgan left their home in Ogden, Utah to embark on a week-long trip aboard a Royal Caribbean Cruise liner with daughter Chloe. By day two, Emily who was due in December, began having contractions and called the doctor. It was an incredible odyssey at sea with more ups and downs than most pregnancies go through. “By 1:20 the doctors had come in to assess what was going on. By 1:56, Haiden was born,” Morgan said from the hospital in Miami. Doctors told Emily she miscarried, and her son Haiden died. Then 45 minutes later, they told her he survived. “I knew that he was a functional baby and to be told that he was no longer alive was something that you always remember,” Morgan said. But doctors worried he wouldn’t make it. The ship isn’t outfitted with medical supplies for deliveries so Emily and nurses improvised. “She wrapped him up in some towels and she found a sanitation napkin and we put it over his head to keep heat in and then we found some saline pouches we put them in the microwave and I put them under his body. Kinda made a little incubator for him,” Morgan said. The cruise ship was about 14 hours away from it’s next port in Puerto Rico. Emily is grateful the captain got them there two hours early. “The 2 hours was actually something that more than likely really made a difference and saved his life,” said Morgan. They stayed in Puerto Rico for three days until a medical jet could fly them to Miami Children’s Hospital where they’ve been for several weeks now. Haiden is stable. 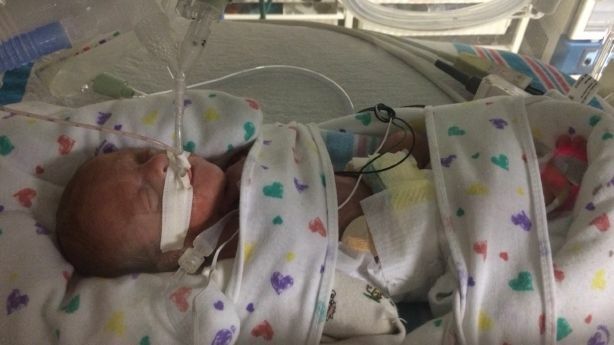 His lungs are developed, but the micropreemie has good days and bad days. “His hands are the size of a quarter, his foot is the size of your pinkie, and length of his body is the length of a dollar bill,” Morgan said. The outpouring of support she’s received on behalf of Haiden has been touching. “He`s definitely developed a huge family all across the United States. I can`t tell you how many people have called and just said we`re praying for him,” Morgan said. The family is hoping Haiden will be healthy enough to be life flighted to Primary Children’s Hospital next month. They have set up an account at America First Credit Union under “Haiden’s Medical Journey” to help with expenses. There is also a GoFundMe page where people can donate.